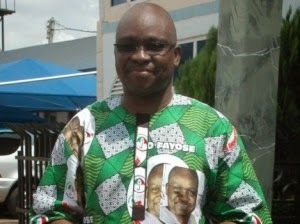 Ekiti State Governor, Mr Ayo Fayose, has said the ego of the All Progressives Congress (APC) has been eflated as it has tactically conceded defeat few days to the March 28 presidential election, according to LIB. The governor, who spoke through his Chief Press Secretary, Mr Idowu Adelusi, in Ado-Ekition Thursday, said that the sudden u-turn made by the North which had realised that General Buhari would be made to shortchange the North had rattled the party. Fayose also disclosed that the issue of health of the former general had become worrisome to ‎the Northern caucus which did not want to forget in hurry the Umaru Musa Yar' Adua saga. According to the governor, the APC was forced to cancel presidential rallies in ‎Kaduna and Enugu because Buhari was not yet physically and mentally fit to go for any rally. The governor said that while Buhari was still recuperating in a London hospital‎, he had to come back home due to pressure mounted on him by certain leaders of his party who wanted to douse the growing apprehension by Nigerians over Buhari's state of health. Fayose also noted that former Vice President Atiku Abubakar and his supporters were already retracing their steps back to the PDP and that the North had seen the deceit in APC South-West leaders in pushing forward Buhari, even against the man's interest. "We thank the APC for conceding defeat in the coming elections. At least, they, for the first time, appear realistic. General Buhari's insistence that he must be allowed to attend to his health is commendable. "It is glaring that he needs to rest and not waste energy on a failed project. The man has been abandoned by those who claim to be his backers and Buhari's people have told him the bitter truth. That they would prefer to wait for another four years than to get trapped by some selfish South-West leaders for eight years. "The preoccupation of the APC now is how to retain the APC- controlled states and prevent the PDP from capturing them. "The tactical withdrawal of people like Atiku, Kwakwanso and the battle for survival by Tinubu and Amaechi in Lagos and Rivers have woken up General Buhari to the politics of deceit that some are luring him to. "While PDP leaders are confidently traversing the country meeting Nigerians and getting their support, APC leaders are held up in their hideouts. Who among them is canvassing support for Buhari now? Tinubu, for instance, is only pre-occupied with his aim of maintaining his stranglehold on Lagos' resources by putting another stooge in the Government House, Ikeja, but this time around, he has failed woefully. "Kudos to patriotic Nigerians and Northern leaders who have seen the deceit called APC and refused the bait flaunt at them. APC is a dead horse, no amount of flogging can wake it up,"he said.